Removing bacteria and contaminants from water is an important point of concern for safety reasons. One method of purification involves the use of water treatment basins. CFD modeling provides an efficient route for optimizing the design of these basins to ensure their overall effectiveness. Simulation apps, as we’ll highlight here, are taking things one step further by extending the scope of such modeling capabilities to a much wider audience. Consider your routine on any given morning. In addition to brushing your teeth, the list of items might include taking a shower and brewing a cup of coffee before you head out the door. Many of the tasks that we perform throughout the day involve the use of water. In fact, according to the United States Environmental Protection Agency, the average family in America uses over 300 gallons of water each day within their own home. Of equal importance to the quantity of water that is made available to us is the quality. We depend on both the availability and quality of our water supply. Licensed by CC BY-SA 3.0, via Wikimedia Commons. When it comes to water quality, an important factor to consider is the impact of contaminants. 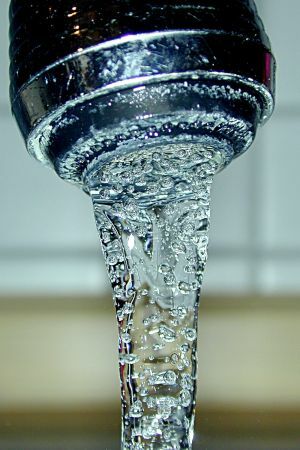 Manmade contaminants, from various chemicals to pathogens, can often be introduced into a water supply. These elements can negatively affect the overall quality of the water, while posing potential health risks for consumers. Water treatment basins offer one approach for purification. Used on an industrial-scale level, these basins feature baffles that control the flow of the water through the structure, filtering out contaminants as they settle toward the bottom. Chemicals like chlorine, valued for both its effectiveness and low cost, are typically used within the basin to further eliminate disease-causing microorganisms in water. Optimizing the design of water treatment basins is, of course, a key step in ensuring that the water is properly purified. 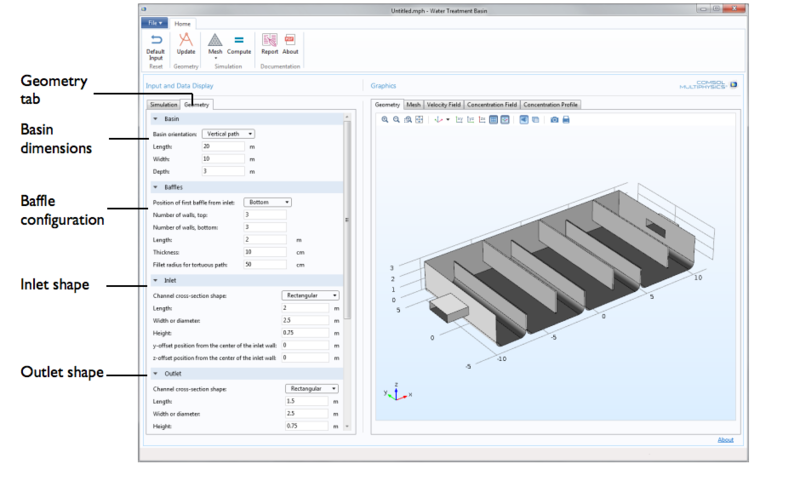 Simulation tools like COMSOL Multiphysics help to identify such a configuration quickly by removing the need for physical prototypes at each stage of the design workflow. 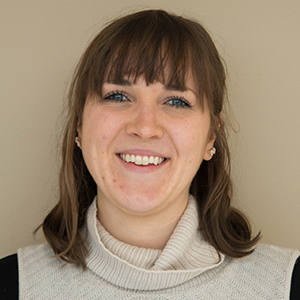 What once translated into a heavy workload for you, the simulation expert relied upon to run such tests, has evolved into a more collaborative effort with the development of simulation apps. You can now empower your colleagues to perform simulation studies independently and obtain their own results. Our Water Treatment Basin demo app illustrates one such example. The Water Treatment Basin demo app is designed to represent the chlorination basin in a water treatment process. When combined with filtration, chlorination is an excellent way to disinfect drinking water supplies. The model upon which the app is based features a turbulent flow with the k-ε turbulence model. A free surface condition is applied to the water surface, while the deformation of free surface is neglected. The solute’s concentration is set at the inlet, and the turbulent mixing effect is considered in the mass transport. While the design of the app itself is simple, all of the underlying physics included in the embedded model are made available in the app, ensuring accuracy in the simulation results. The following series of screenshots provides a more detailed look at the layout of the app. The left side of the window, as you can see below, includes two settings forms: Simulation and Geometry. Let’s begin with the Simulation form. This form enables app users to determine operating conditions, explore simulation results, and evaluate the solution time and status of a simulation. Simulation settings for the Water Treatment Basin app. The Geometry form, meanwhile, can be used to modify the basin’s dimensions as well as set the fillet radius for its corners. Here, it is also possible to indicate the number and position of the baffles within the geometry along with identifying the horizontal or vertical positions of the tortuous path. Geometry settings for the app. Shifting over to the right side of the user interface, you’ll notice the Graphics section. This section includes various tabs that display the geometry, mesh, and plots illustrating the results from the simulation studies. 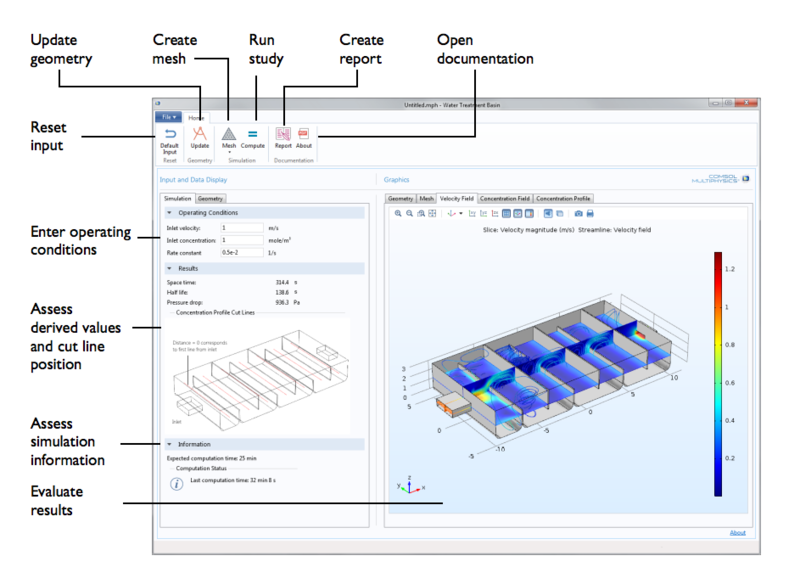 By exploiting all of the visualization features within COMSOL Multiphysics, apps make it easy to communicate simulation results with others, modifying the design as needed to achieve the optimal performance. Further enhancing the experience for app users is a series of buttons in the main toolbar that allow for easier navigation. Such buttons save steps when it comes to updating the model geometry, adjusting mesh size, and running computations. With a simple click of a button, users also have the ability to create a customized simulation report. This report can serve as a helpful resource, whether presenting results to others or consulting past results for further design considerations. The example that we have presented today speaks to the power of using simulation apps to model turbulent flow in 3D, while accounting for species transport that are subject to chemical reactions as well. If you are interested in modeling such elements, we encourage you to use this example as a guide when building apps of your own, embracing the flexibility of the Application Builder to tailor the app’s design to your particular needs. Why wait? Start building apps today.